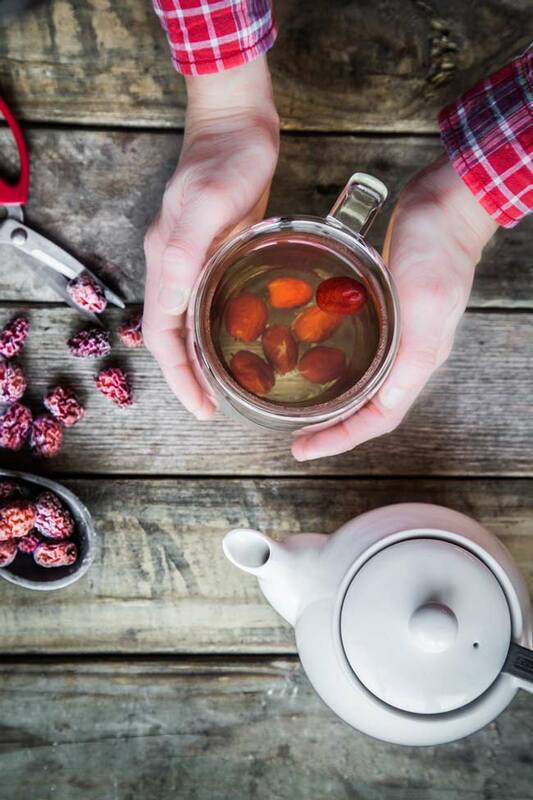 Red dates tea is made of Chinese red dates simmered on low heat for a period of time. It’s a super simple tea (with no tea leaves involved) that can be enjoyed throughout the year. Enjoying tea is pretty much part of Chinese culture and now I can probably say it has gotten so common everywhere around the world that you will be overwhelmed by what kind of tea to get and to drink to promote health or just for enjoyment. I’m almost towards the end of eighth months of pregnancy. Okay, what does that have to do with this post? My mom called me the other day and asked me if I have any Red Dates in my pantry. I normally use Red Dates for cooking Chinese traditional herbal soup, so the answer was YES. I was informed that now, at around 34 weeks of pregnancy, is the perfect time to start drinking Red Dates Tea 2-3 times/week. 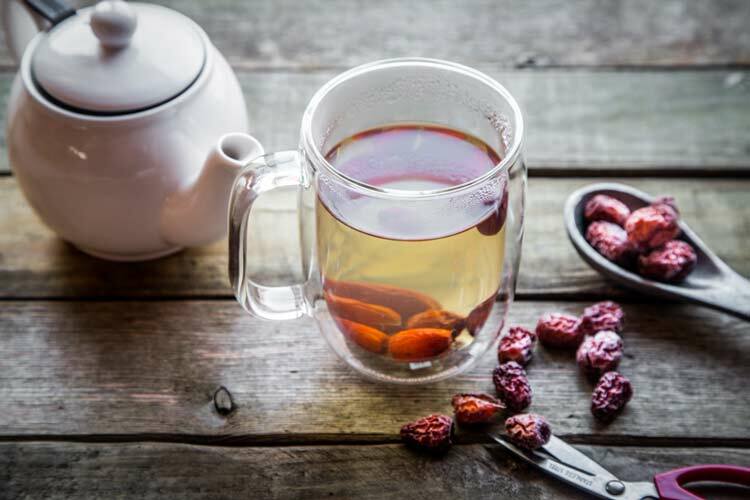 The Chinese believe that Red Dates tea has a “tonic” effect on the liver for a pregnant woman at this stage of pregnancy (not earlier than 34 weeks) and also to the baby. Please don’t ask me for any systematic review of scientific data to support this as I don’t have it 😉 I just ride along with the Traditional Chinese belief and I don’t see any harm in doing this either. As a matter of fact, I think it’s fun to take part in this process during pregnancy. This Red Dates tea is also going to be my best buddy from now on until 1-month post pregnancy with an exception that post-pregnancy, there will be few more herbs added to the red dates tea and I will be drinking it every day as much as I can (almost replacing water completely). Why ? It is also believed that post-pregnancy, the body loses “heat” or the Chinese often call “Qi”. 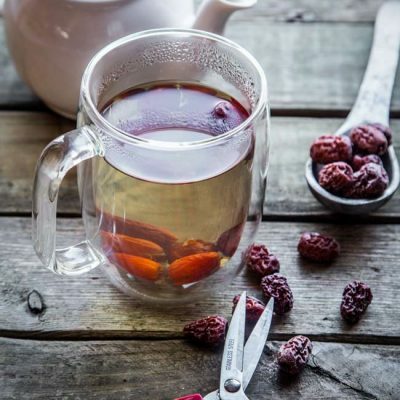 So, the Red Dates tea and among many other foods specifically prepared for a pregnant woman, will help to restore the heat and help the body to recover from labor and delivery. Okay, way off the track, now back to the Red Dates Tea. It has to be prepared in a specific way, specific amount and specific time and even though it is called Red Dates Tea, there is no tea leaves or tea of any kind involves in this. Huh?!? it is called Red Dates Tea because it looks like the color of tea. 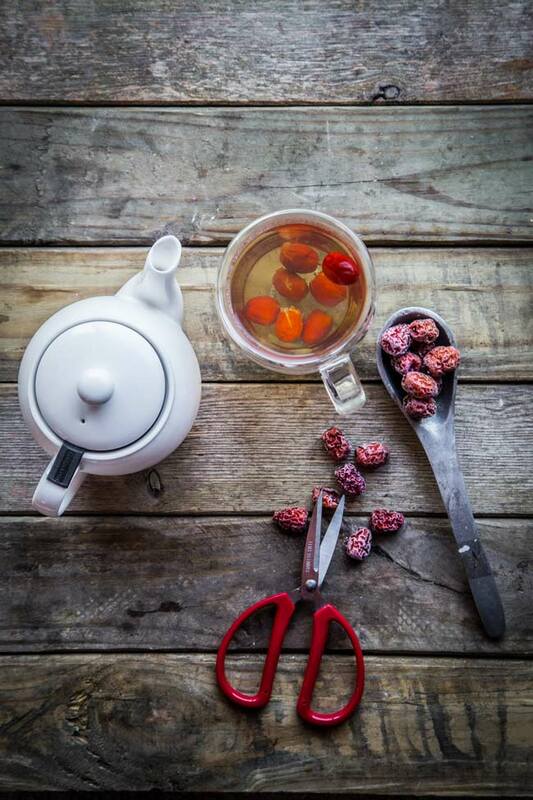 Red dates tea is made of Chinese red dates simmered on low heat for a period of time. 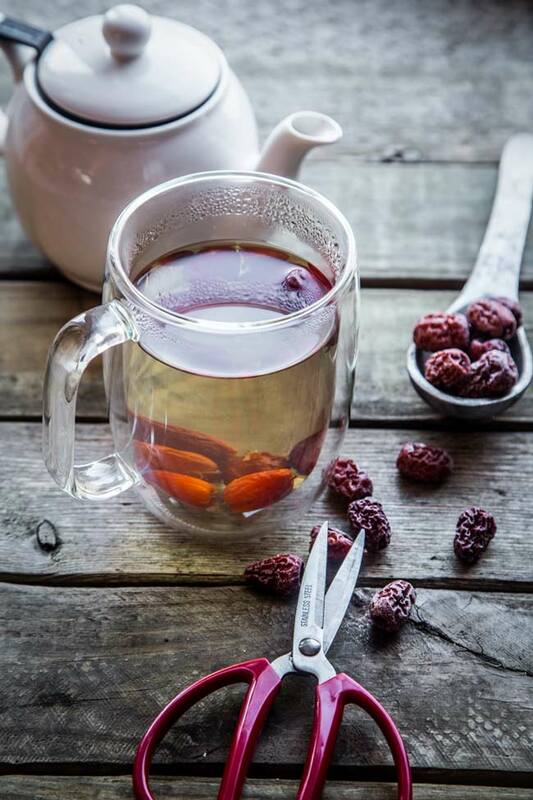 It's a super simple tea (with no tea leaves involved) that can be enjoyed throughout the year. Fascinating and incredibly interesting post! I grew up in Germany and there are a lot of “home remedies” that my mom and grandma used. Best of luck for your last few weeks and I can’t wait to read more about your confinement diet! Susi: Thank you. I will be learning about this whole Confinement Diet along the way from my mom as well, so it will be interesting. Hi…can we drink red dates tea from 10 weeks of pregnancy onwards? My mom told me that usually this red dates tea is consumed from 34 weeks onward and not earlier to get the “tonic benefit”. Honestly speaking I can’t tell you for sure whether it will make much difference whether to consume it as soon as you know that you are pregnant or at much later time. As you know with Chinese herbs, there are not much written scientific evidences you can count on and most of them are just “what you heard from someone” I would imagine, it should be okay to drink the red dates tea at 10 weeks too, probably the recommendation from 34 weeks onward has something to do with the benefit only, but I don’t think it will do any harm to drink red dates tea at 10 weeks. Definitely check with your doctor if you are doubtful. Sorry I can’t give a clear answer on this topic. I had red date tea too after the 2st trimester but with additional 2 items, dang shen & gou qi zi. These are all to be boiled with water on stove for 2 hours. I had my baby boy out with rosy cheeks! Sorry for the typo error its 1st trimester. When the red dates are in the water either simmering or boiling, after some time, a white “powder” appears. What is this and should I filter it before drinking? Hmm…I’ve never seen this before actually, so I can’t really tell you what it is. There shouldn’t be any “powder” or residue in the tea. Make sure the red dates you are using are clean because these are “sun-dried” I believe. I started acupuncture and the acupuncturist told me to make this tea to help with anxiety. Is this something the tea is for? He just said to put the dates in boiling water for awhile (not many details!). So that’s what I did and got the powder floating on the top. I am making it again now and incorporated some of what you said. I soaked them for awhile (not overnight). I also made 7 snips in them like your mom said! (not 6, not 8 lol). They’ve been simmering for more than 40 min. So far no powder. I let them simmer so long because the color of the water is still quite clear, not brown like tea usually is. My acupuncturist said it should be brown in color. It looks a little lighter than the tea in your picture. Is that the normal color it should be? Well, my mom said it’s more for “tonic” purpose than anxiety. I soaked the red dates overnight in the water and then being simmered for 1 hour after that, so maybe that’s why mine is much darker in color. Thanks for your recipe. I’ve been wanting to make red date tea for months and now I am, thanks to your recipe! Your blog is lovely. Sorry for the late reply. I’ve never tried using slow cooker for this recipe, so I can’t tell you exactly in terms of the “benefit” from drinking the tea after such long cooking hours. But, for convenience wise, sure..I don’t see why not. I was never a tea drinker up until I moved to Ireland where I started drinking tea with milk a lot :). Later on my boyfriend introduced me to loose tea (which I wasn’t fond of much) and now I can’t imagine a day going by without drinking tea. Mostly loose ones. I love this version and was wondering if you can use normal dates to make the tea. Never seen red dates selling anywhere. Can i use dried dates instead of the fresh ones? Thanks for the recipe. Is it beneficial to eat the red dates after drinking the tea? Hi Melissa, I still eat them after the tea though because I like them. They may not taste as sweet anymore. I think it may not have “much” left after being cooked for a period of time! Is 1 glass the limit for a day during PP? Am only 6 days PP now. Can I start now? I’m so excited when I found your blog! I’m 38weeks pregnant and looking for confinement recipes. Thank you for posting this. Just curious, have you ever used instant pot? Which makes everything faster? Congratulation on your pregnancy! So excited for you! I have yet to try instant pot with this red dates tea, but I do own an IP (which I love). This is one of my older recipe and I haven’t owned IP yet at that time. You can certainly make this tea with IP. I would double or triple the recipe and pressure cook on high for 20-30 minutes.